Holiday listings are available through December 31st. 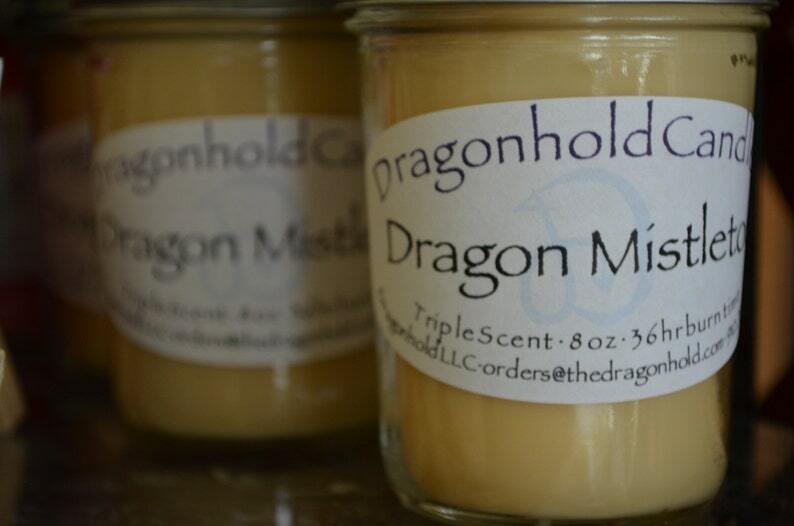 Dragon Mistletoe: A blend of citrus, blue spruce, and frosted cranberries create this perfect holiday scent! This fragrance is infused with Fir, Peppermint, and Cedar Leaf essential oils. Burn time is approximately 36 hours. Our candles are all hand poured in small batches with Soy-Paraffin wax that is Paraben free and Triple Scented. We utilize zinc core wicks. Excellent throw is obtained with each candle. If you wish to purchase 4 or 12 pleas use the provided listings. My Absolute 100% FAVORITE CANDLE EVER EVER EVER!! !